P.K Subban is one of the best defence man in the NHL. He is smart outgoing and always up for a good time. 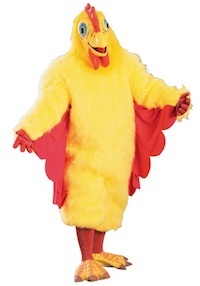 One time he dressed up as a chicken with his team mate and pretended to be cooked. He has also dressed up at Christmas to surprise the children who were in the hospital. Another time he dressed up as an old man who look after a hockey arena to surprise a group of young hockey players. 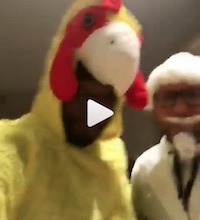 Here’s a link to the Instagram post that shows PK dressed up as a rooster and his teammate as Colonel Sanders. Click here to find more celebrity costume ideas. Find KFC costume ideas below for PK Subban and Colonel Sanders. The 100 percent polyester construction has polyurethane foam filling. The jumpsuit has a zipper up the back. The costume comes with cute foot and hand covers that have elastic straps to stay put. The details include a red stuffed tail, comb, and wattle just like a human sized chicken. The mask covers the whole head and has mesh see through eyes to see out of. The best part is the large stuffed beak has a mouth opening so folks can hear you talk. This costume includes a yellow, acrylic jumpsuit that ties at the back of the neck as well as velcros for closure. It is covered in faux fur with red wings attached to the torso and sleeves while elastic lines the ankle cuffs for a secure fit. A latex mask with a friendly chicken face also features yellow, faux fur and slits for clear vision and breathing. Red latex gloves, red stockings and detailed chicken feet, which are held in place with elastic, complete this costume. 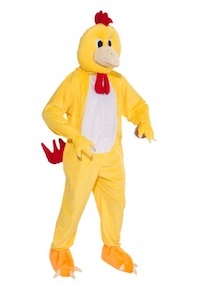 Click here to get PK Subban Chicken Costume. 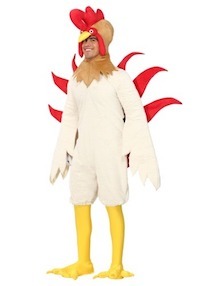 This exclusive Rooster Costume features a full-body faux fur jumpsuit with jagged wing-shaped sleeves and wired tail feathers for perfectly posing your plumage. The headpiece is a soft-sculpted rooster face with the iconic crest and the jumpsuit legs end in with elastic cuffs that fit under the knee-high webbed rooster foot shoe covers. This white suit is going to take your look over the top! 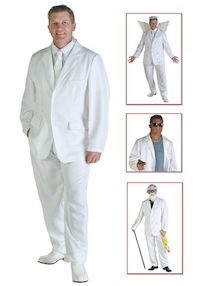 Become your favorite pop culture character with our versatile white costume suit! This suit is made of 100% polyester twill fabric and the suit jacket has buttons and faux pockets for added detail. The pants have an elastic waist for a fit that’s comfortable all night and functional pockets so you can stash all of your important stuff. Click here to get the Colonel Sanders Costume. This White Colonel Wig and Moustache. The iconic look of the southern gentleman can be yours with this white haired wig of synthetic fibers and matching (and flawlessly groomed) goatee. Both are trimmed in a debonair flair and will raise the quality of any costume at a price less than a bucket of chicken. 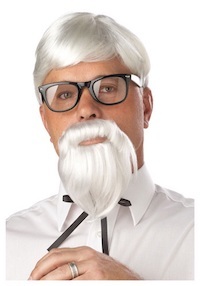 Click here to get Colonel Sanders Costume Wig and Moustache.